There are few things more satisfying than running your hand over a rack full of cashmere sweaters, right? My dad teases my mom and I when we're out shopping, asking why we must touch and comment on every garment's texture within arm's reach. I mean, it just feels good. And many a Christmas has passed where my mom has received an especially fluffy sweater from yours truly, her partner in petting. Sure, a company can do its job to create an attractive, pleasurable product for us consumers. But—you guessed it—the store does its own part in tricking us, ensuring that the phrase "you touch it, you buy it" often holds true. Shopping all comes down to accessibility. We're 35% more likely to buy something that's at eye-level compared to an item we need to squat down to see on the bottom shelf or call in a store manager to grab via ladder-climbing. And think about all those perfectly touch-able items at the checkout lane—namely, candies. Really think about them. How are they arranged? More often than not, the gross little fruity candies are at the bottom for the children, while gum adorns the top shelves for grown-ups. Kids can easily grab the Starbursts and Runts in their little pink fists and threaten an all-out tantrum if you don't tack them onto the end of the conveyer belt. 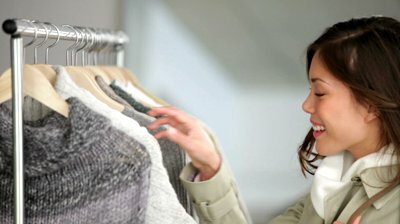 In studying so-called "shopaholics," researchers have found that shoppers may have a sense of ownership—that something already belongs to them—before even purchasing it. A 2008 study from Ohio State University published in Judgment and Decision Making found that these feelings can begin as quickly as 30 seconds after first touching an object. Participants in the study (n=84) were presented with a drinking mug and held it for either 10 seconds or 30 seconds. They could then bid for the mug in either a closed (where bids could not be seen) or open (where others' bids were public) mock auction. They were also told the retail price of the mug before bidding—$3.95 for the closed auction, and $4.95 for the open auction. On average, the longer people held the mug, the more they were willing to pay for it—$3.91 vs. $2.44 in the open auction, and $3.07 vs. $2.24 in the closed auction. During four out of seven auctions, in fact, the average winning bid exceeded the mug's retail price—two mugs even "sold" for $10. "People can become almost immediately attached to something as insignificant as a mug," says lead author James Wolf. "Once they begin to feel it is theirs, they will go to greater lengths to keep it." In the past few decades, retailers have been increasingly pushing the "try-then-buy" tactic, from free samples to car test-drives. The next time you go inside a store, check out all the touch-able items at eye-level, and especially note the lower arrangements for kids in toy aisles. As for me—well, winter and cashmere sweaters are out of the picture with the changing of the seasons, so Mom and I will just have to bide our time touch-testing some new summery cotton blouses. Nice post. I wonder if trying an item on (like a coat) has even a stronger effect.